The most amazing thing about SCTs? They’ve gotten cheaper. Back in the day, in 1995, I paid over two-thousand dollars for my Ultima 8 SCT. It was a nice enough telescope with very good—if not perfect—optics and a sturdy fork mount and tripod. However, there was no goto or other computerization. The mount was powered by a 9-volt battery. Turn it on and the telescope tracked, turn it off and it stopped. It did have a Periodic Error Correction (PEC) feature, but when you turned the scope off at the end of the night, your hard-won PEC “recording” was lost and you had to re-do PEC all over again the next evening. Otherwise? 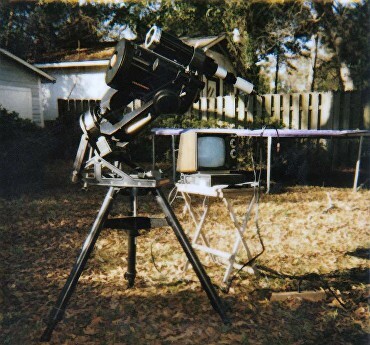 If you can bump the budget up to 2700 George Washingtons, you can have an LX200 GPS, a telescope that doesn’t just include just about every conceivable computer feature, but which has a mount at least comparable to that of my old Ultima’s massive fork. Oh, and the LX has a much better-looking field edge than the Ultima 8’s thanks to the telescope’s ACF, “Advanced Coma Free” optics. While I haven’t done the computation, the LX200’s current price is still likely less in real dollars than what I paid for that manual telescope in '95. Me and my new Ultima 8 circa 1995..